The value in a Facebook page is only achieved by getting the fans “Talking About This.” Facebook can be very effective for a dealer with fewer than 2,000 fans, as long as the fans are engaged, i.e., Likes, Comments, Shares. These actions are what fuel and broaden awareness of your dealership and it’s from these that the “Talking About This” score is derived. These actions are the key to the dealership being seen by fans and friends of fans. Being seen by friends of fans is the Holy Grail of social media marketing, as it equals “Social Validation,” which is what leads friends of fans to come to you as customers. 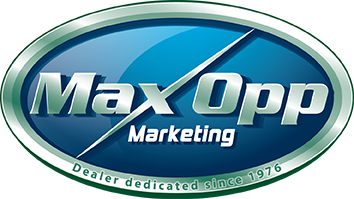 MaxOpp’s Daily Facebook Accelerator Service strategy actively engages us in our clients’ Facebook pages several times each day to review content, like, respond to comments, answer questions and forward leads. Our strategy humanizes our dealers’ pages in a way that allows fans and friends of fans to get to know them. We build relationships that create trust and interest, ultimately driving fans and friends of fans to your doors! Custom email created every two weeks and sent to your entire Dealer database. Emails include a custom message – interest-capture image – manufacturing-incentive highlights – links to key destinations in your website – Facebook highlight and invite – Department Promotion – Vehicle Specials or Offers – Events, etc. We gather this information on our own, or accept what is provided/requested and then create, test, deploy and evaluate each email. And, we keep your customer email database up- to-date. Monthly investment $479 (up to 5000 email addresses) and a one-time setup fee of $350 to assist in cultivating and organizing an email database from your management software and current email list (if available).